Here's a little roundup of some of my favorite ways to save money, simplify my housekeeping, and be kind to the planet — all at the same time! Incidentally, I'm a little picky in that I don't want to do things just because they're frugal; I also have to like the results. These are time-tested tips that have made me happy I switched to the more frugal method. I use a diluted white vinegar spray for cleaning bathrooms, kitchens, floors, and windows. So, pretty much anywhere you'd want to spray a cleaner. I fill a spray bottle 1/4 to 1/3 full with cheap white vinegar (you can get a gallon of store-brand vinegar for a couple bucks) and then top it off with tap water. Vinegar helps cut through mold and disinfect, and it's safe on most surfaces (including fabric, excluding granite). It's nontoxic and edible, so it's safe to use around children, food, and pets. The scent dissipates once it dries, though you can add some lavender essential oil to the mix (tip courtesy KellyNaturally) to mask it in the meantime. Technically, water cleans almost everything. I thought vinegar in a spray bottle was already pretty cheap and easy, but I've recently gone one step lazier more frugal. I already dust with just a damp rag, but I needed to clean the upstairs sinks and couldn't find my spray bottle (turns out it was hiding in the downstairs bathroom — long story1). I took my microfiber cloth, got it wet, and started swiping. Wouldn't you know it? The counter and sink looked as clean as ever. I went on to clean the other sink, the other vanity, the toilet, and the bathtub — all with just water and a little errant soap. Speaking of which, I recommend you start cleaning at a sink, because you're sure to pick up some dripped soap on your way. Now, that's frugal. Speaking of soap, dish detergent works for hands, too. Don't believe the silly commercials about dishpan hands. I've been using dish detergent in my liquid hand soap dispensers for years, and my hands are just peachy. Several years ago, I first heard about the problems with using antibacterial everything (superbugs, hello! ), but I still liked liquid hand soap better than the bar kind. I tried finding cheap, non-antibacterial liquid hand soap, and it was almost impossible. We were doing much of our shopping at that point at places like Big Lots, and all they had was the antibacterial kind. I did, however, find large, cheap quantities of non-antibacterial liquid dish detergent. As I was pouring the big bottle into the little dispenser we keep at our kitchen sink, I had to ask myself: How different was this from hand soap, really? I decided to put it to the test, and filled up our bathroom dispensers as well. A little goes a long way, because it's highly concentrated. It can be easy to overuse, and this also means it can take longer to rinse off. One tip I just learned about from Kimberly at Homeschooling in Nova Scotia's post for the Carnival of Natural Parenting would be to invest in a foaming soap dispenser so that we're using less detergent at a time and it will last even longer. I switched from using a soap that had some lotion built in, so I found my hands felt more degreased after using dish detergent (not surprising). I solved this by just having a bottle of lotion available at every sink for any time my hands feel dry. I'm now completely used to it and rarely use the lotion. It's much gentler on our hands than antibacterial soaps. I can't believe now how dry my hands feel when I'm out and have to use the soaps commonly found in public restrooms. 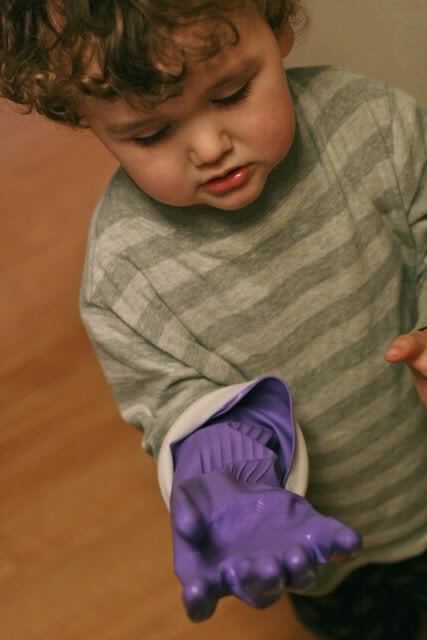 We also had an incident where we used scented antibacterial soap for a week that a visiting relative brought, and Mikko's hands started flaking apart. By contrast, we've had no skin problems related to using dish detergent regularly. It works just fine in common hand pumps, so we can buy a big bottle to keep in the kitchen and just refill the smaller glass dispensers around the house as needed. This is frugal and much greener than buying a new plastic dispenser every time the bathroom soap runs out. It lasts a long time, since you need so little per handwashing. It's multipurpose, because you can use it for general cleaning, too. (See above.) We've ditched our ugly plastic detergent bottle by the kitchen sink and use a pretty hand one there, too — easy to squirt onto a sponge as we're cleaning dishes. I thought maybe a visiting guest would call us on it, but no one's noticed. In an attractive dispenser, it's just as pretty as a hand soap. The kind of dish detergent we use is an eco-friendly, natural option that we buy in bulk from Costco. I would definitely recommend looking for a natural brand, or you could end up with ingredients just as questionable as those in antibacterial hand soap. Technically, I'm not supposed to dry laundry out on our balcony. But the stains on my inserts were killing me, and I just had to find out: Does sunshine really bleach as fast and as thoroughly as proponents swear it does? You be the judge, from these pictures Jennifer of True Confessions of a Real Mommy took. Before, and after just a few hours 1.25 hours! Keep in mind that sun also sanitizes, just as liquid bleach would (only better and greener! 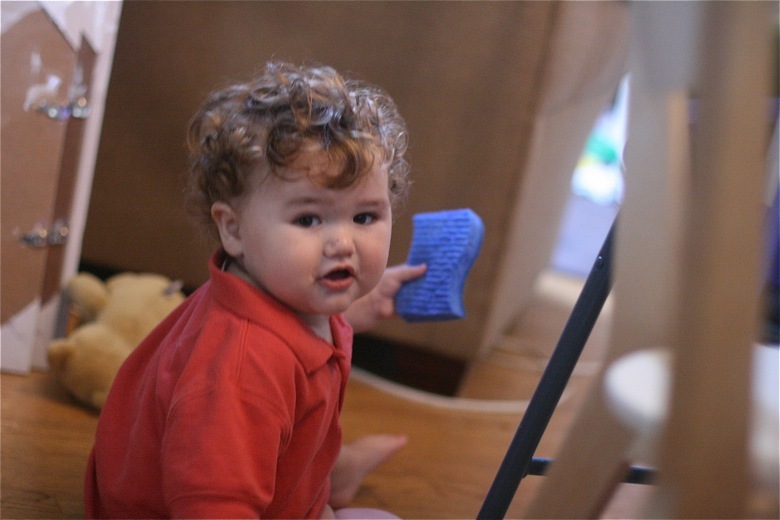 ), so it's really perfect for cloth diapers and burp cloths and cleaning rags and anything you want super-duper clean. 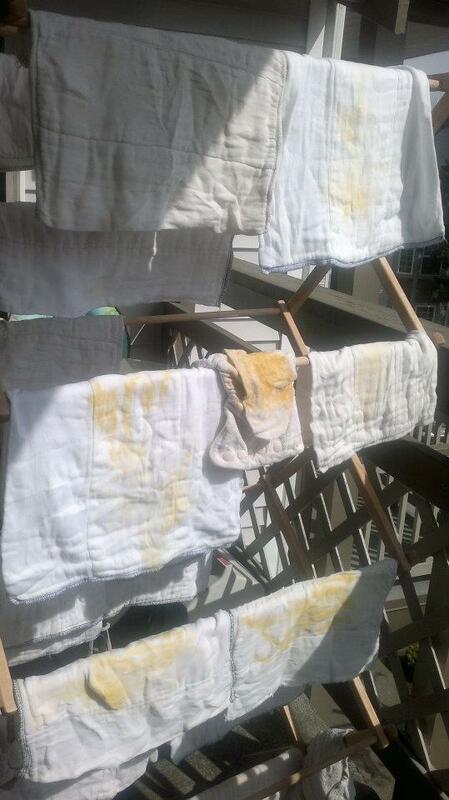 Baking soda and vinegar freshen laundry. A cup of baking soda in a load will help get out stubborn smells, and a cup of vinegar will make sure all the detergent rinses away and soften clothes a bit. I don't use vinegar in my cloth diaper wash, due to some concerns that it could weaken synthetic fabrics over time, but it should be fine in a load of just prefolds. I love using it in family cloth to sanitize a little and kill any yeast. Wool dryer balls work better than fabric softener. 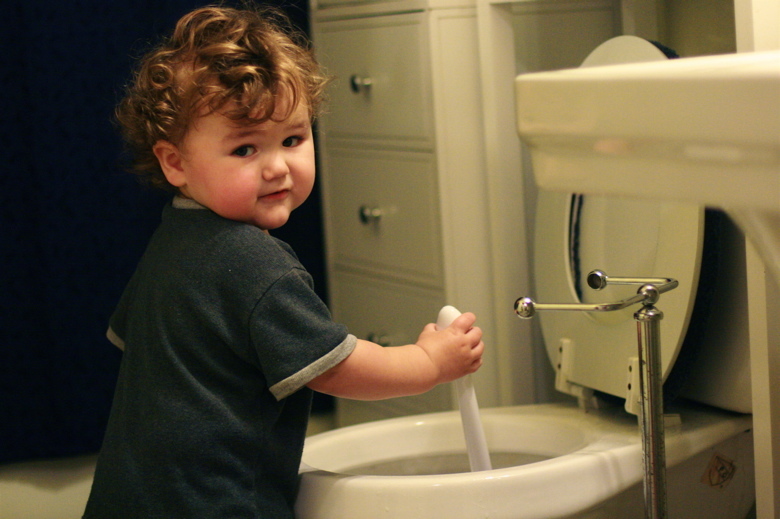 Cold water cleans clothes — and diapers. After another Carnival of Natural Parenting post, at The Pistachio Project, prompted me to give cold water-only washing a try, I've been doing it. For clothes, towels, sheets, cloth diapers, family cloth (yes! ), cloth menstrual pads, dish rags … everything. It's fine. Everything's clean; we haven't gotten sick; the laundry smells like: nothing. Just as it should. Bonus? No more sorting by colors. I wish vinegar and baking soda actually cleared clogs, but it doesn't — at least, not in our sinks. We don't want to use caustic chemicals to clear (and damage) the pipes (and/or plumbers). And opening up the trap to scrape it out by hand is … icky. So we use a manual drain cleaning tool. I feel sheepish admitting this, because we bought the product we use at a store that sells As Seen on TV knockoffs (oh, I know, one step lower than As Seen on TV!). But — hey — it works. And it's way cheap. (It looks like a floppy plastic stick with notches and a rectangle with a hole in it on the end, and they're called things like Zip-It, EZ Zip, and Mini Snake. You can reportedly find a version at Home Depot for a couple dollars, so check there before paying shipping.) It's marketed as single-use, but we've used it several times now. If it doesn't work for you or breaks after you look at it crosswise, I apologize; I know it's a cheap plastic piece of junk. I'm just saying, it works for us! I've ditched the one-use products. I used to think the latest and greatest convenience products would outweigh my distaste for cleaning. All they did was clutter up my broom closet. For mopping my floors, instead of the spray mops with disposable pads, I now use — wait for it — a mop . The kind with a washable sponge attachment on the end, and a way to squeeze out excess water. I just add water and, if needed, a little soap or vinegar. I don't even use a bucket — just wet it and rinse it in the kitchen sink. Similarly, I used to have disposable dusters and dusting rags of various kinds, until I admitted to myself: I really just don't like dusting. Ah, well. When I do it, I now use a feather duster and a damp microfiber cloth. 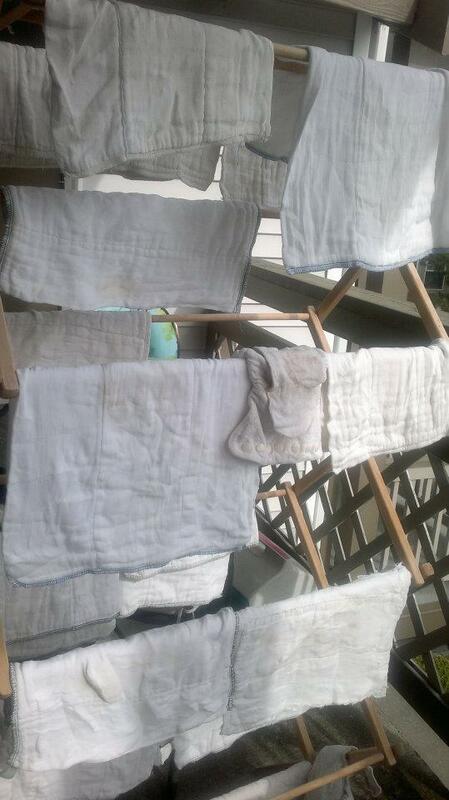 I shake out the feather duster on the balcony and wash the cloths in with my laundry. I never did try the one-use toilet cleaning wands. I spray a little vinegar or squirt a little detergent onto the reusable toilet brush and scrub away. Even without cleaning agents, just the friction of scrubbing will clean off any grime. If you bought a new wand every year, it would still be less waste than buying a new wand pad for every toilet cleaning. I like the kinds that have an extra brush attached for scrubbing under the rim. I used to also try out different fancy scrubs and sprays and handles and whatnot for cleaning kitchens and bathrooms. Seriously? Rags. That's what you need. Rags, water, elbow grease. You're good to go. I also dig reusable gloves. 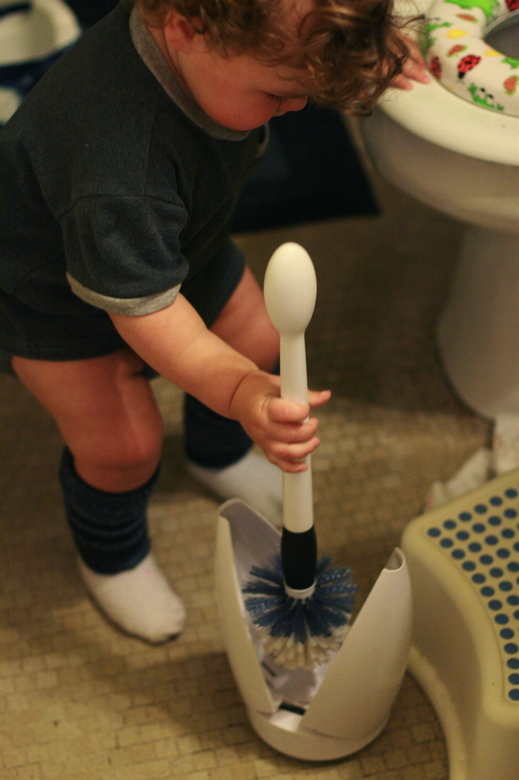 Another thing I like about these inexpensive, green housekeeping solutions is that kids can be around them — and they can help you clean! What are your favorite frugal household tips? Hey, I looked up the time stamp on my pictures: 1 hour and 15 minutes. In a weak Washington sun. Love it! I've fallen in love with eco-hacks. If you really need to dust and shine, 1/4 cup OO plus one tablespoon of lemon juice (and no I don't squeeze my own- I use the big bottle of stuff) in a spray bottle is justpeacy on wood. I am also a huge fan of Dawn and vingear in my bathroom. It some kickin' soap scum remover. I always think the old fashioned plunger is under appreciated in cleaning out clogs. I definitely agree with the vinegar! It cleans and it cleans well, without all the nasty chemicals. That is an impressive difference that a little sun can make! I use the dish detergent in the soap containers, but I add a little water to them so the kids don't go over board. This prevents having to buy any more foaming attachments or anything. I also found at Wal-Mart a laundry detergent called Foca, it comes in a bag and is less than $3.50. It goes a long way, is phosphate free (so it's like using the baby detergents and is good for sensitive skin) and it is a powder but quickly dissolves if you add it to the water before the clothes. 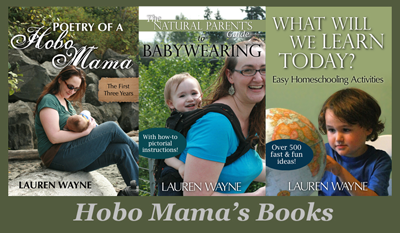 I am a single mom of 3 boys and 1 girl, so I am always looking for cheaper ways to cut corners. You can imagine how much laundry I have piled up and a bag lasts me 1 1/2 weeks or so. So for less then $15 a month, and it works great too. I use mostly just water to clean as well - it works! Sometimes I want a little abrasive, and a little Bon Ami usually does the trick. My husband, bless his poor heart, is expert at snaking drains, which we had to do twice a year on a major scale before we cut down the (small, but surprisingly healthy, haha) tree that had its roots in our sewer. You know, all those nasty chemicals like Drano - they don't actually work. What works is snaking the drain. It's unpleasant to contemplate, but you can either do it yourself or you can pay someone $500 to do it - in the end, I think you're wasting your money on Drano in addition to severely polluting the environment.